NEW YORK New York City mayoral candidate Bill Thompson conceded the Democratic primary race to front-runner Bill de Blasio on Monday, averting a runoff and clearing the way for de Blasio to campaign for the general election. Thompson endorsed de Blasio at City Hall, saying he was proud to support him as the party's nominee to "make this city work for all New Yorkers again." "The path to getting there begins with Bill de Blasio walking through these doors as the next mayor of the city of New York," Thompson said. Thompson also asked his supporters to back de Blasio, saying the party needed to put aside its differences to elect its first New York mayor since 1989. 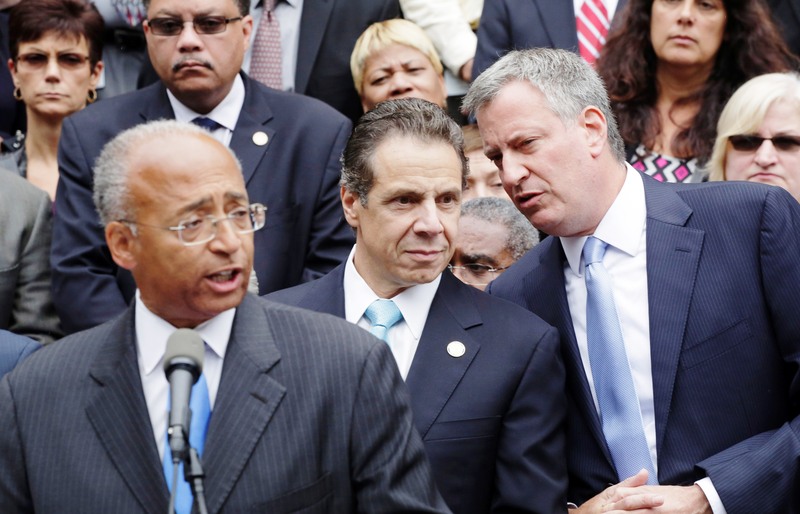 "Bill de Blasio and I want to move the city forward," Thompson said. "This is bigger than any one of us." The potential Oct. 1 runoff had loomed as another act in the Democratic drama over choosing a successor to three-term Mayor Michael Bloomberg - a fight that would keep Democrats tilting at each other while Republicans and independents looked ahead to the general election. With Thompson out of the race, de Blasio will face Republican nominee Joe Lhota and independent candidates Nov. 5. Gov. Andrew Cuomo played a role in brokering the deal, according to people familiar with Thompson's decision who spoke on condition of anonymity because they were not authorized to talk about private conversations. "New York will be an even greater city under the leadership of Mayor Bill de Blasio," Cuomo said at the City Hall event. "... The best days of New York City are ahead, and today, we take the first step." In unofficial returns with 99 percent of precincts reporting, de Blasio had had 40.3 percent of the vote - slightly more than the 40 percent threshold needed to win outright. Thompson was second with 26.2 percent. Those results put pressure on Thompson to concede and spare the party further division ahead of the general election. A check of the more than 645,000 ballots cast was finished Sunday and was to be announced Monday afternoon. Some 78,000 absentee and other paper ballots were to begin being counted Monday. Thompson reiterated Monday that every vote needed to be counted, criticizing the Board of Elections for its tardy results. Speaking to reporters after the news conference, he said he would have likely stayed in the race had the city issued him matching funds for a runoff. "Not being able to really raise and spend, how can you run a campaign when you can't do any of that?" Thompson asked. He also noted that by the time the vote count was completed, he'd have less than two weeks until the runoff. De Blasio has said Thompson had every right to want the official count. Currently the city's elected public advocate, de Blasio has been riding a wave of momentum built during the last month of his campaign, which he billed as "a progressive alternative to the Bloomberg era." After lagging behind in the polls, de Blasio got voters' attention by protesting a hospital closing - and getting arrested - and airing ads in which his teenage son gave voice to his liberal platform and showed New Yorkers de Blasio's interracial family. Thompson, a former city comptroller and the only African-American in the race, has run a more centrist campaign, offering himself as a seasoned, thoughtful manager. Thompson had called the Rev. Al Sharpton, an important city power broker and longtime friend, to inform him early Monday of his decision. Sharpton endorsed Thompson when he ran for mayor in 2009 but stayed on the sidelines this race. That deprived Thompson of a loud advocate in his bid to win the majority of black voters, among whom De Blasio and Thompson ran even, according to exit polls. Sharpton will likely endorse de Blasio in coming days, according to a person close to Sharpton who was not authorized to speak on the decision before it is made public and spoke on condition of anonymity. Thompson hadn't led in polls of the crowded Democratic field this year, but supporters noted that he had been underestimated before: Thompson came much closer than predicted to unseating Bloomberg in 2009, despite being vastly outspent. While a runoff had been anticipated, trying to figure out who would be in it had been something like Parcheesi for politics junkies. City Council Speaker Christine Quinn was the front-runner for months and jousted with Thompson for second in polls as recently as early September. Ex-U.S. Rep. Anthony Weiner leaped to the front for a time after getting into the race in May, before the public learned that his X-rated exchanges with women online continued even after similar sexting spurred his 2011 resignation from Congress. Lhota ramped up his general election campaign over the weekend and was expected to address de Blasio's nomination later Monday. Independents Adolfo Carrion Jr., a former Bronx borough president, and Jack Hidray, a tech entrepreneur, will also be on the November ballot. Thompson's decision to drop out avoids would could have been a costly fortnight for Democrats, experts believe. "It (would be) another two weeks of sniping at each other and giving Joe Lhota, Adolfo Carrion and whoever else is running a chance to point out the sniping and get their message out," said Michael Benjamin, a Democratic political consultant.